Founded in mid-2003 by Dr. John Pastore (Inn owner, animal lover and Boston cardiologist), the Mountain View Farm Animal Sanctuary is a non-profit Vermont corporation dedicated to providing farm animals, especially ones with a difficult past, with a good future and a chance at a long and healthy life; as well as educating the public on appropriate care and treatment of animals. Please see our Mission page. 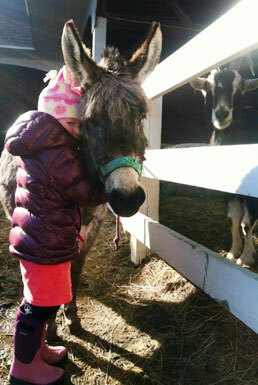 The idea of a sanctuary for large farm animals began informally in 2001 with the arrival of Molly and Emmy, a mother-and-daughter pair of miniature Sicilian donkeys, whom Pastore found in a petting zoo at a country fair. Upon arrival at Mountain View Farm, Emmy was two months old and on the verge of death, so Pastore immediately brought her to the Rochester Equine Clinic in New Hampshire for treatment. After 15 days in their newborn intensive unit, Emmy went “home” to Mountain View Farm where she is now healthy and thriving. Molly, Emmy’s mother lived happily on the farm for many years before passing away at an old age to cancer. Since Molly and Emmy’s arrival, the sanctuary has welcomed many more creatures in need; allowing them to live out their lives with plenty of love and quality care from the farm staff and community. Current and past inhabitants of the sanctuary range from Yorkshire pigs, a family of Pygmy goats, Shetland Sheep, to Holstein steers, various breeds of horses, and a couple of barn cats that happened to find us. 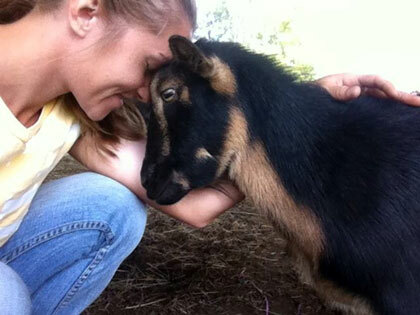 Many of the sanctuary’s inhabitants have come from equally somber stories as Molly and Emmy, and were saved from sad fates by Pastore’s good will. The Mountain View Farm Animal Sanctuaryis located on the same property as the Inn at Mountain View Farm, owned by Dr. Pastore and his wife Marilyn. Inn guests and the general public are welcome to visit with the animals. © 2015 - Pres. MVFAS.org | Multimedia, Inc.